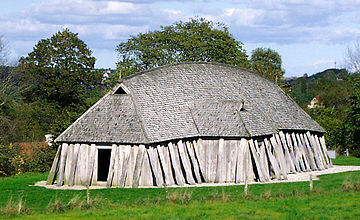 A reconstructed Viking Age longhouse (28.5 metres long). In ancient Scandinavia and Germanic Europe a mead hall or feasting hall was initially simply a large building with a single room. From the fifth century to early medieval times such a building was the residence of a lord and his retainers. The mead hall was generally the great hall of the king. The old name of such halls may have been sal/salr and thus be present in old place names such as "Uppsala". The meaning has been preserved in German Saal, Dutch zaal, Frisian seal, Icelandic salur, Swedish, Norwegian and Danish sal, Lithuanian salė, Finnish sali, Estonian saal, Izhorian saali, Hungarian szállás, French salle, Italian/Polish/Portuguese/Spanish sala and Russian зал(zal), (all meaning "hall" or "large room"). In Old English, sele and sæl were used. These words are etymologically related to the modern English words salon and saloon. The word as a whole ("mead-hall") is a direct cognate with the Sanskrit term "madhushala" which refers to a pub or tavern. From around the year 500 C.E. up until the Christianization of Scandinavia (by the 13th century), these large halls were vital parts of the political center. They were later superseded by medieval banquet halls. Gudme, Denmark. Two similar halls were excavated in 1993. Of the so-called "Gudme Kongehal" (King's hall) only the post holes were found. The larger of the two was 47 meters long and 8 meters wide. Gold items found near the site have been dated between 200 and 550. The Iron Age graveyards of Møllegårdsmarken and Brudager are close by. The halls may have been part of a regional religious and political center serving as royal feasting places with Lundeborg serving as harbor. The unrelated Neolithic long house was introduced with the first farmers of central and western Europe around 5000 BC. Later longhouses did not come into use until more than a thousand years after the neolithic version ceased to be used. Germanic cattle-farmer longhouses emerged along the southwestern North Sea coast in the third or fourth century BC and are the predecessors of the German and Dutch Fachhallenhaus or Low German house. The Scandinavian or Viking Langhus, with the variants of traditional farm house such as excavated in Vorbasse, a garrison/barracks type for warriors such as found at the Viking ring castles and the sophisticated large banquetting halls such as the mead halls. Ingjald burning his subordinate kings alive in his new feasting hall. There are several accounts of large feasting halls constructed for important feasts when Scandinavian royalty was invited. According to a legend recorded by Snorri Sturluson, in the Heimskringla, the late 9th century Värmlandish chieftain Áki invited both the Norwegian king Harald Fairhair and the Swedish king Eric Eymundsson, but had the Norwegian king stay in the newly constructed and sumptuous one, because he was the youngest one of the kings and the one who had the greatest prospects. The older Swedish king, on the other hand, had to stay in the old feasting hall. The Swedish king was so humiliated that he killed Áki. The construction of new feasting halls could also be the preparation for treacherous murders of royalty. In the Ynglinga saga part of the Heimskringla, Snorri relates how, in the 8th century, the legendary Swedish king Ingjald constructed a large feasting hall solely for the purpose of burning all his subordinate petty kings late at night when they were asleep. 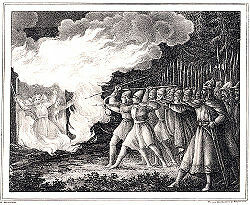 According to Yngvars saga víðförla, the same ruse was done by the Swedish king Eric the Victorious and the Norwegian ruler Sigurd Jarl, when they murdered Áki, a rebellious Swedish subking, at Gamla Uppsala, in the late 10th century. From at least the tenth century onwards in Norse mythology, there are numerous examples of halls where the dead may arrive. The best known example is Valhalla, the hall where Odin receives half of the dead lost in battle. Freyja, in turn, receives the other half at Sessrúmnir. The story of Beowulf includes a Mead-Hall called Heorot that was so big and had so much attendant laughter that the creature Grendel broke in and slaughtered the noisemakers. In fiction, mead halls usually appear in works that take place during the Middle Ages. In J. R. R. Tolkien's fictional universe of Middle-earth, Meduseld (meaning mead hall in Old English) was the great Golden Hall built in Rohan. Meduseld was a large hall with a straw roof, which made it appear as if it were made out of gold when seen from far off. Its walls were richly decorated with tapestries depicting the history and legends of the Rohirrim, and it served as a house for the King and his kin, a meeting hall for the King and his advisors, and a gathering hall. Also, a mead hall is the central location of Beorn's home grounds where he serves mead and food to Bilbo Baggins, the Dwarves and Gandalf in The Hobbit. In The Elder Scrolls by Bethesda Softworks, a race called the Nords, who resemble the Germanic peoples, build large mead halls, such as Jorrvaskr found in Elder Scrolls V: Skyrim. In Shrek the Third, Prince Charming visits a mead hall in order to gather some fairytale villains in order to do the "dirty work" with him in the film. The film, How to Train Your Dragon has a brief scene with a mead hall. The film Beowulf mostly takes place in a mead hall. In Norwegian comedy television series Norsemen (TV series) (Vikingane in Norwegian), celebrations were frequently held in the village's mead hall. ^ Brink, Stefan, 1996. Political and Social Structures in Early Scandinavia. A Settlement-historical Pre-study of the Central Place. ^ Christensen, Tom. "Lejre Beyond Legend — The Archaeological Evidence." Journal of Danish Archaeology 10, 1991. ^ Sørensen, Palle Østergaard, 1993. Hal på hal Skalk 1993:6. -1994. Gudmehallerne. Kongeligt byggeri fra jernalderen. Nationalmusees Arbejdsmark. Pictures of the hall on the Lofotr museum homepage. A list(pdf) of twenty large Iron Age Halls. From the book "The Idea of the Good"(OPIA 15.) by Frands Herschend. 1998. Uppsala: Uppsala University Department of Archaeology & Ancient History; 91-506-1276-X ISSN 1100-6358 .